Even apart from the story of Elizabeth Woodcock, Impington residents have had their share of Ball lightning unusual happenings. One summer day in 1941 an Impington resident had agreed to help repair the bomb damage at Stradishall aerodrome. A thunder storm began there and people were amazed to see a bright fiery ball come whizzing down from the sky. It was yellow and the size of a football and it missed one of them by only 12 feet. When it hit the ground it remained whole and began to zigzag about. It struck their horse which was pulling a cart in which brick rubble was carried away. The horse was killed instantly, the shafts of the cart were broken, and the ball disappeared. It was a very rare form of lightning called ball lightning. It was probably attracted towards the horse by the latter’s metal horseshoes. Published according to Act of Parliament 1756. To the penetrating geniuses of Oxford, Cambridge, Eton, Westminster and the learned Society of Antiquarians. This curious inscription is humbly dedicated. Printed for J.Bowles at No. 43 in Cornhill and Carrington Bowles No.69 in St Paul Churchyard London. 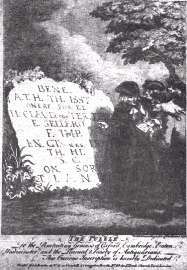 No-one of this name was ever buried in Impington churchyard, and this engraving is thought to be a joking challenge to the scholars of the period to see if they could understand the inscription and see through the practical joke.